Brizzly Opens To All. And Snatches Someone From Facebook. Brizzly was first unveiled in private beta at our first CrunchUp event in July, so it’s only appropriate that today, the day of our next CrunchUp, it’s being opened to the public. Now, to be clear, the product is still technically in beta, but that’s only so the team at Thing Labs can keep experimenting with new ways to make Brizzly even better. 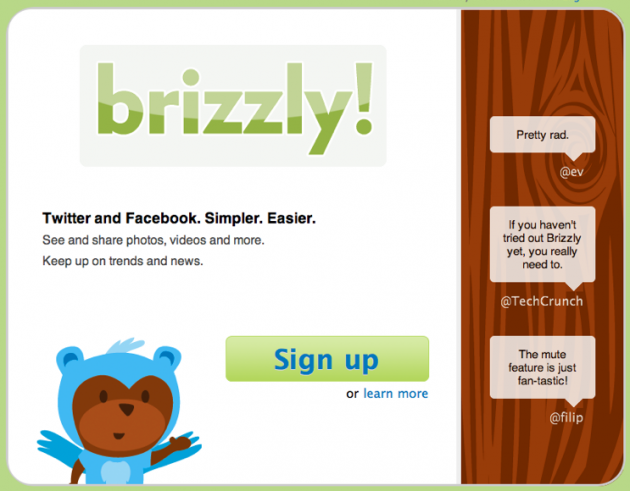 For those who have not had the opportunity to try Brizzly yet, it’s a web app that serves as a way to interact with both Twitter and now Facebook. It has advantages over Twitter’s regular website because it shows pictures and videos inline, and they actually did lists (which they called Groups) before Twitter. Now that Twitter has rolled out that functionality, Brizzly has integrated it. Perhaps more importantly, Brizzly also offers as one-click way to do the old-school way of retweeting. You know, the “RT” way. But the opening of its service is not all Brizzly is announcing today: They’ve also made a new hire. Ben Darnell joins the team from Facebook, where he worked for just a few short months since he came over after the FriendFeed acquisition. But Darnell’s ties run close to Brizzly as he’s a former Googler like Thing Labs’ Jason Shellen, Chris Wetherell, Dolapo Falola. At Google, Darnell was one of the original Google Reader team members. With Brizzly, Darnell will work on “larger framework for communication and content discovery,” Shellen tells us. This means he’ll be working on their infrastructure and APIs. And Brizzly has one more new trick up its sleeve today: On-the-fly translation of tweets. While Twitter is busy rolling out its service into other languages, Brizzly is translating it to anyone who wants it thanks to Google Translate. Translating a tweet is as simple as clicking a button.